Can you place one petabyte of data into a single unit of a rack? Apparently, Intel can. As the usage of SSDs is growing every day, still a lot of living data on the cloud is stored in the spinning drives, which is available in larger capacities with lower price, Intel is trying to change that with a new form factor for SSDs that could push server capacities into the petabyte range and it’s called the “Ruler” form factor. 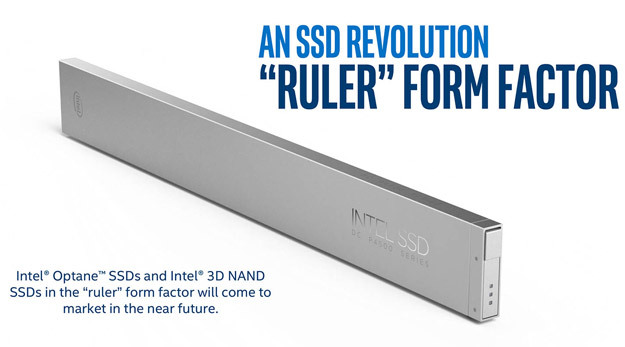 Clearly, Intel’s new SSDs in the Ruler form factor is shaped like a ruler. As you know a hard drive (HDD) needs to make room for the spinning platters and other mechanical components which Solid State Drives (SSD) don’t. So Intel built the Ruler SSDs to literally fit in 1 unit server rack! Intel is being very conservative about offering specifics on capacity and interface but it says that slotting a Ruler SSD in your server rack can get you 1 petabyte of space for engaging a single unit! It’s a very good trade for a single rack, And it sounds better when you thinking to do that with 10TB hard drives would require 4 unit server rack with 100 drive slots! Ruler SSDs will be available with standard 3D NAND storage or Intel’s new “Optane” memory technology for improved speeds and efficiency. Intel’s new ruler SSDs can be a significant improvement when it comes to space and power efficiency and Intel hopes that the new SSD form factor can encourage data center operators to upgrade to what is sure to be a more expensive hardware. Intel has not actually released any pricing or availability details yet, All we know is that the new drives are rolling out in the near future. HugeServer expands to Florida ! Jacksonville,FL was choosen for it’s advantages in providing lower latency network connectivity in higher performance grade to East Coast US and South America , focused on Brasil and the Caribbean. it’s also offer lower latency to European customers. Our network at Jacksonville,FL has two diverse rings from Atlanta,GA and Miami,FL which offers incredible network uptime ,reliability and performance. We have three transit carriers in our Jacksonville location including : TWTelecom , nLayer and Level3 Communications . also our network is Noction IRP Optimized which is a great value . Noction IRP analyze and optimize traffic routes in real-time and decrease latency up to %30 for outbound routes ! The facility is a SSAE16 certified Data Center, the most secured Data center in Florida and it’s protected 24×7 by armed officers. In addition to Jacksonville,FL HugeServer also offers dedicated server and Colocation services in Los Angeles,CA and Atlanta,GA .